The US is quitting Paris Agreement and that became even more obvious after the G20 summit. But ever since Donald Trump’s original announcement of leaving the agreement, most coal companies are still falling. While renewable energy industry is on the surge. A strong part of Donald Trump’s campaign was based on the denial of climate change and how to help the US coal industry. The president announced in Pittsburgh on 2 June 2017 that the US is leaving the Paris Agreement. He hoped to help coal industry, but so far the market does not believe in his ideas of the future of coal. 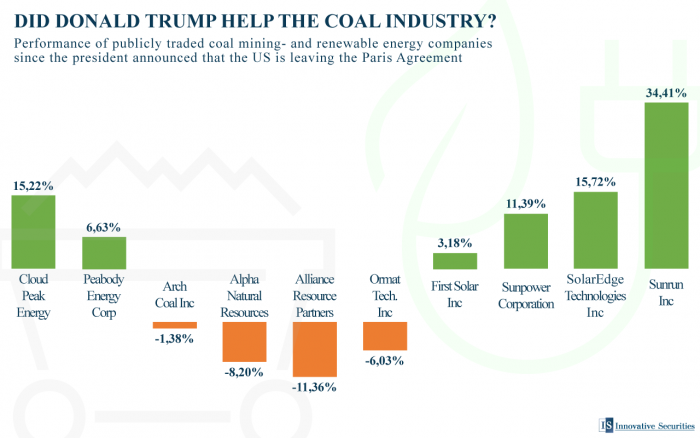 We have analysed the stock prices of the biggest publicly traded US coal and renewable energy companies between the announcement of leaving (2 June 2017) and just after the G20 summit, where Trump again confirmed that the US is leaving (10 July 2017) even though other world leaders have been pleading not to do so. Generally, coal companies aren’t doing very well lately. 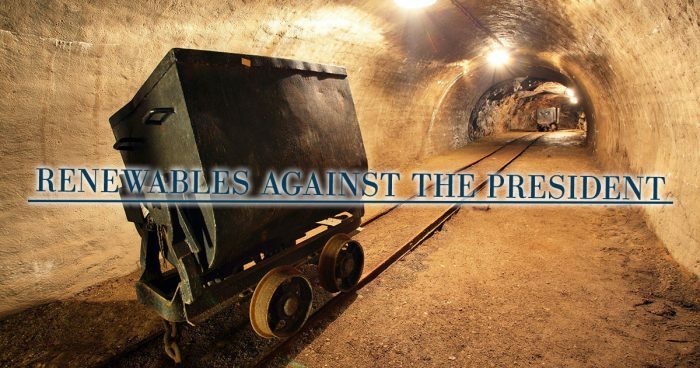 Most of the mining companies went down, while only Cloud Peak Energy and Peabody Energy Corp managed to gain value. Some companies were falling during the G20 summit as well, so it’s safe to say that the changes are not due to Trump’s words. Rather, the recovery in oil and gas prices is the reason behind the minor growth that coal can get. Alternative energy corporations on the other hand performed rather well in the same period. Only one of them fell while the others were surging, several of them reached two-digits growth in one month. During the campaign, many believed that Trump’s idea of strengthening the coal industry is not simple as there are not only less harmful materials than coal, but also much cheaper. This may fluctuate a bit, as we see that gas is going up lately, but the markets are backing up the sceptics. Morgan Stanley also believes that renewable energy is the future. Altogether, no matter how hard Trump tried so far, coal industry goes down, just not instantly and with some corrections.